For centuries, the experience was called “night-mare” (picture a demonic-looking horse). It was an apt name. You know those accounts of people being abducted by aliens in their sleep? How they feel themselves caught in a tractor beam, how they can see bright light, and how they are frozen, unable to move or call out for help? Sometimes these tales are the stuff of Hollywood or horror novels. Sometimes, though, they’re real. Okay, to be honest, the aliens aren’t real, at least not in this situation. If you believe in alien encounters, by all means, continue to do so. It’s just that when it comes to that pre- or post-sleep sensation, the explanation is all too human. We’re talking about a phenomenon called sleep paralysis. Sleep paralysis? Yes! You can be temporarily paralyzed when you are falling asleep or waking up from sleep. Here are 10 things you need to know about this strange—and frankly quite terrifying—phenomenon. The biggest symptom of sleep paralysis is that you can’t move any part of your body. You’re aware enough to try to move, but you can’t. You’re completely immobile for a few seconds to a few minutes. Many, but not all, people experience hallucinations in which they see or hear things that aren’t real. Anxiety is a common symptom of sleep paralysis. It’s most intense during the episode, but it can persist afterward, too, because the experience can be extremely frightening. Evidently, you’re more likely to experience sleep paralysis when you’re sleeping on your back. If you’re on your back and experience sleep-related leg cramps, sleep paralysis is more likely to occur, too. Sleep paralysis can happen as a part of other conditions, such as PTSD, bipolar disorder, stress, or a lack of sleep. Sometimes it happens to people on certain medications. Being able to see and think and feel yet being unable to move or call for help is a disturbing experience. However, there is there is no actual harm being done to your body during an episode of sleep paralysis. Physically, your body is fine. Because the experience is surreal and nightmarish, people report that they were abducted by aliens, controlled by demons, or other such terrifying occurrences. In reality, the images are taking place in the brain. No one is in any sort of danger during an episode of sleep paralysis. When you’re seized by sleep paralysis, your mind works (albeit sometimes inaccurately, as when you’re experiencing hallucinations during the episode), but your body doesn’t. When you’re sleeping, you don’t have control of your body, either. That’s not a problem, though, because you’re not trying to control it. In sleep paralysis, you’re very much aware that you can’t move. This makes fear skyrocket, and the fight-or-flight response kicks in. Unfortunately, you can neither fight nor flee because you have no control over your body. Through the ages, doctors and scientists and the curious have written about what we now call sleep paralysis. Writings from ancient Greece, Persia, medieval and Renaissance Europe as well as from other times periods and places describe the very heart of sleep paralysis. The first officially documented case of sleep paralysis was recorded in 1664 by Dutch doctor Isbrand van Diemerbroeck. The scientific revolution was underway, and the tide had turned. Sleep paralysis was becoming less demonized, but it was still terrifying. It remains so to this day. Studies of human history worldwide reveal a similar fascination with the occult or supernatural. Artwork and storiesdepict witches, demons, ghosts, monsters, and other such sinister phenomenon. Based on images and the stuff of stories, it’s theorized that many of these tales of possessions, abductions, and the like are rooted in people’s experience with sleep paralysis. Without modern science to help them understand the brain and hallucinations, these events were attributed to the occult. This temporary paralysis doesn’t do any damage, and it doesn’t have anything to do with neurological or other diseases. Sleep paralysis is frightening and can cause stress and anxiety. While these are legitimate reactions and can be disruptive to daily life, they won’t cause lasting harm. Sleep paralysis happens infrequently, so the anxiety that accompanies it usually doesn’t linger. Every night when we sleep, we enter a state called REM sleep. This period of rapid eye movement is when we do most of our dreaming, and during this state we are actually paralyzed. Sleep paralysis is a lot like REM sleep, except it happens just as you’re falling asleep (called hypnagogic paralysis) or right as you’re waking up (hypnopompic paralysis). Unlike REM sleep, you’re semi-aware. It can be like you are witnessing your own dreams and nightmares, but you can’t move out of their way. You see things, hear things, feel things. You think things. You don’t know if they’re real. Are you being abducted by aliens? Are you dreaming about being abducted? It feels real. And try as you might, you cannot move a muscle. You’re paralyzed, so you can’t verify that you’re awake by moving, but you know that you’re not dreaming. What you see and hear seem real. However, they’re hallucinations. 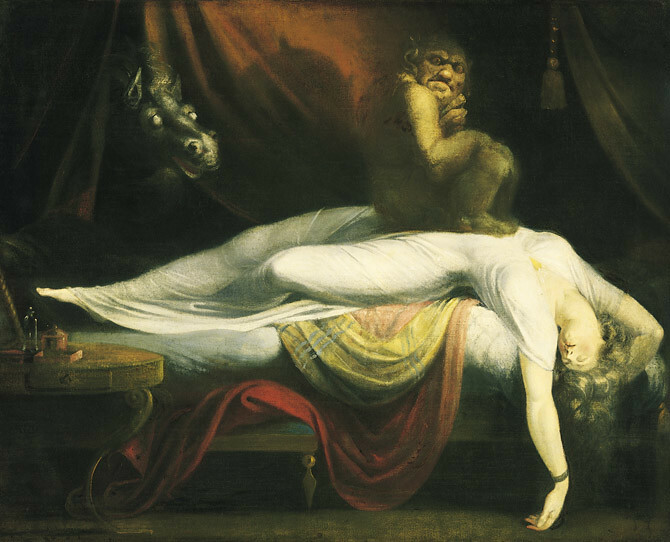 The hallucinations of sleep paralysis could be extensions of dreams. It’s not known with certainty if they come from dreams or different brain activity. What is known is that sleep paralysis feels like a nightmare. Imagine falling asleep or waking up and suddenly becoming aware that you can’t move. You can’t speak. You can’t call for help. You can’t defend yourself against terrifying hallucinations that might turn out to be real. The experience naturally creates anxiety, panic, and dread. Struggle fuels anxiety and panic, and it becomes hard to breath. It can feel like suffocation. It feels like you’re going crazy. It feels like you’re dying. The sensation of slowly, painfully dying is universal among anyone experiencing sleep paralysis. The good news: It is but a feeling. No one has died during sleep paralysis. Sleep paralysis isn’t a disease, but it can be a symptom of a sleep disorder called narcolepsy that involves serious disruptions in the sleep-wake cycle. There are a lot of unknowns about sleep paralysis, but scientists do know that it is brain-based. They also know that it’s frightening but otherwise harmless.